Put your hands up if you think England can win the World Cup. Dan Fitch examines England's odds to win the World Cup and Harry Kane's hopes of being top goalscorer. "When you are in such form that you can score when facing the wrong direction and make no attempt to even kick the ball, then you know that fortune is smiling upon you." Harry Kane is [3.5] to win the Golden Boot. Neither Saudi Arabia or Egypt can make it through to the knockout stages of the World Cup, but this presents a perfect opportunity for one of them to leave the tournament on a high note. "Saudi Arabia have failed to score in nine of their 12 World Cup matches including both defeats this year. Egypt have also only managed to net once in two matches and that came from the penalty spot." Read Simon Mail's Saudi Arabia v Egypt match preview and betting tips here. With Russia having a far superior goal difference, Uruguay need a victory if they are to win Group A. "Russia are available at [2.94] and on the evidence of this tournament alone their price looks on the generous side. This will be their toughest game in the group stage but their attacking game has resulted in eight goals already and will present a challenge to Uruguay." Read Simon Mail's Uruguay v Russia match preview and betting tips here. Iran need a win to qualify for the last-16, while for Portugal a draw would be enough to see them through to the knockout stages. "Their midfield is being overrun and overplayed and putting their defence under constant pressure. They may not be so fortunate this time against an Iran side who will be forced to take a few risks and have shown they can cause a few problems when they go forward in numbers." Read Jamie Pacheco's Iran v Portugal match preview and betting tips here. Spain will look to top Group B with a Morocco side that are already out of the tournament. "Morocco have conceded just twice and given all we've said about a temptation for lacking some ambition here, Spain will be in no hurry to try and be aggressive. And they're unlikely to concede themselves. Their back five reads like 'who's who' a of top European defensive talent and were in good nick during the week." Read Jamie Pacheco's Spain v Morocco match preview and betting tips here. This section of the Daily Briefing is more necessary than ever today, as we imagine that the heady cocktail that saw England's lunchtime kick off mixed with hot temperatures and an inviting beer garden, may have left many of you literally being unable to remember what happened yesterday. So let us refresh your memories. England won a World Cup match 6-1. This is not a drill. The victory over Panama saw England move to the top of Group G by virtue of having picked up less yellow yards than Belgium, with whom they otherwise share an identical record. 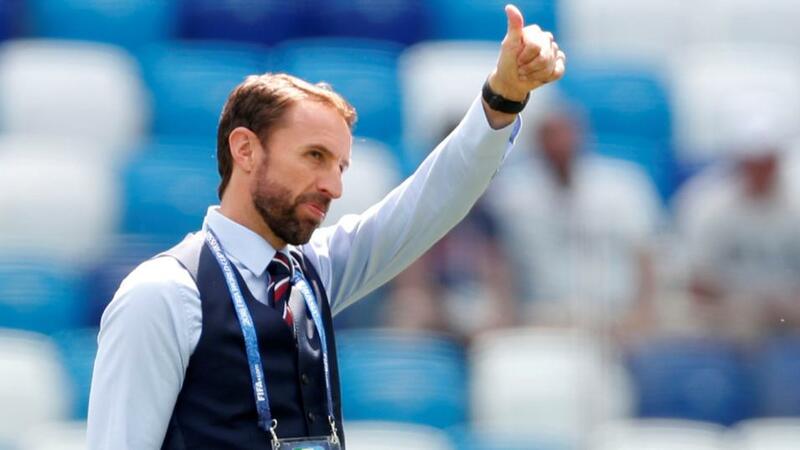 England are now the [1.8] favourites to win the group, with Belgium at [2.16]. Over in Group H we had a dramatic day in which the two frontrunners, Senegal and Japan, played out an entertaining 2-2 draw. That was followed by Colombia recovering from their opening loss to beat Poland 3-0 and dump the Europeans out of the competition. Colombia now trail Japan and Senegal by only one point. With Japan facing a Poland team without much to play for, they are the favourites to win Group H at [2.34], with Colombia at [3.25] and Senegal at [3.7]. Could it? Might it? Come home? English punters should be commended for not getting carried away... yet. England have only narrowed slightly to [11.5] to win the World Cup and remain the sixth favourites. Spain still lead the way at [5.9], with former favourites Brazil out at [6.6], Germany at [8.0], Belgium at [9.2] and France at [10.0]. We have a new favourite! Harry Kane's hat-trick means that he now has five goals after two games. When you are in such form that you can score when facing the wrong direction and make no attempt to even kick the ball, then you know that fortune is smiling upon you. Kane is [3.5] to win the Golden Boot. On four goals are Romelu Lukaku at [6.6] and Cristiano Ronaldo at [4.2], who is in action this evening. Diego Costa will hope to add to his total of three goals and trades at [7.6].